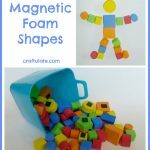 These craft stick magnets are easy to make and have so many fun uses! For these magnetic craft sticks I just used adhesive magnetic tape and plain craft sticks – although colored sticks would be great too! I cut pieces of tape in half length-ways, and stuck them onto some plain craft sticks. I also cut some sticks in half so we would have some variation. 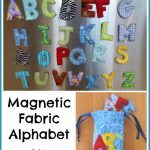 I really need to get myself a magnetic board because when I made the Magnetic Fabric Alphabet I discovered that the only place magnets will stick to is the dishwasher. Which can sometimes be inconvenient. Anyway, I gave them to F and we started to make some shapes. After a while he got out his Fabric Alphabet and played with everything together. Another day he played with the magnets by himself and this was his finished masterpiece. I think we’ll have these for a long time and get many uses out of them – especially if I can find more magnetic surfaces! Five months on and he is still playing with these sticks. And left to his own devices he still hasn’t got very crazy with his designs! Great idea! Wish i could remember where, but another site suggested using giant metal oil (they are flat) pans from Walmart for magnetic boards. You can paint with white board or.chalkboard paint for.double.duty. i use large cookie sheets. you can get them at walmart in three different sizes. they work great.